Adobe Flash Player 22 has been released and is available for download and testing. The latest release has been codenamed as Townsend. The new Flash Player 22 includes enhancements and bug fixes related to performance, security, stability and device compatibility. The fixes are for both Flash Player 22 and Adobe Air 22. 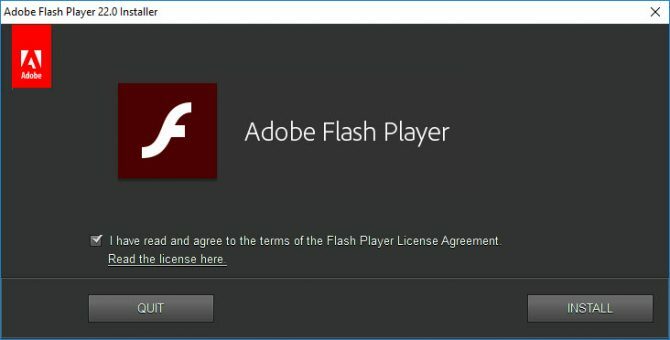 Normally if you have Flash Player installed on your computer and have automatic updates enabled, the new version will be installed automatically when the final version of Flash Player 22 is released. But if you want to go a step ahead, then you can download and install the latest beta versions of the Flash Player installer. Before we discuss the latest enhancements and security fixes in Flash Player 22, let’s go through the direct download links to its offline installers. Please note that ActiveX component of Flash Player 22 is not compatible with Windows 8, Windows 8.1 and Windows 10. This means that you can install Flash Player 21 for Google Chrome and Firefox while Internet Explorer and Microsoft Edge browsers will get the Flash update through Windows Update only. Interestingly in this release, there have been no bug fixes reported as of now. Since its still in beta at the time of this writing, we may see some bug fixes before the final release of Flash Player 22. Now let’s go through some of the enhancements and new features introduced in this version. Most of the features are related to Flash developers but the performance improvements and enhancements will definitely user focused. While this feature has been enabled in Adobe Air 17.0, Flash Player integrates this in version 22. Previously, the use of video in Stage3D required the use of the Video object, copying of video frame to a BitmapData object, and loading of the data onto the GPU which is CPU intensive. Now it makes use of hardware acceleration reducing the amount of CPU used and enhancing the performance overall. Flash applications usually use Appdata/Roaming directory to store information like local shared objects, logs etc. This can be problematic when the Appdata directory is placed on a network location (usually the case in enterprise offices). Now Adobe provides mms.cfg, the configuration file where a user can change the information storage directory. There are a lot of other features which are mostly related to developers. If you want to go through all the enhancements and features, you may see the release notes for Flash Player 22 here. Too bad both of these links only get you a Stub Installer .. worst idea some idiot programmer ever came up with.